So trough my work I got invited to the Swedish Cancer Fund's yearly fund raising TV event. I have been invited several years but we have declined but this year we opted to get a babysitter. THe event is a live tv show and that is about it so nothing before or after. We did not dress up like som of the other people that showed up. Since there is no food we stopped at Täby C for some sushi and then headed in to the city (Stockolm) to find suitable parking. We found parking close to Cirkus and had plenty of time to hand in our coats and get a drink (for Sarah and water for me). Once we were seated we got a good view of some celebrities taking their seats on the floor closest to the stage and the production team getting ready. A few minutes before the start they gave information what to do and not to do. Cirkus is a pretty small venue but it might have come off a bigger because the 2 hostesses were running around all the time and getting on camera in different locations. 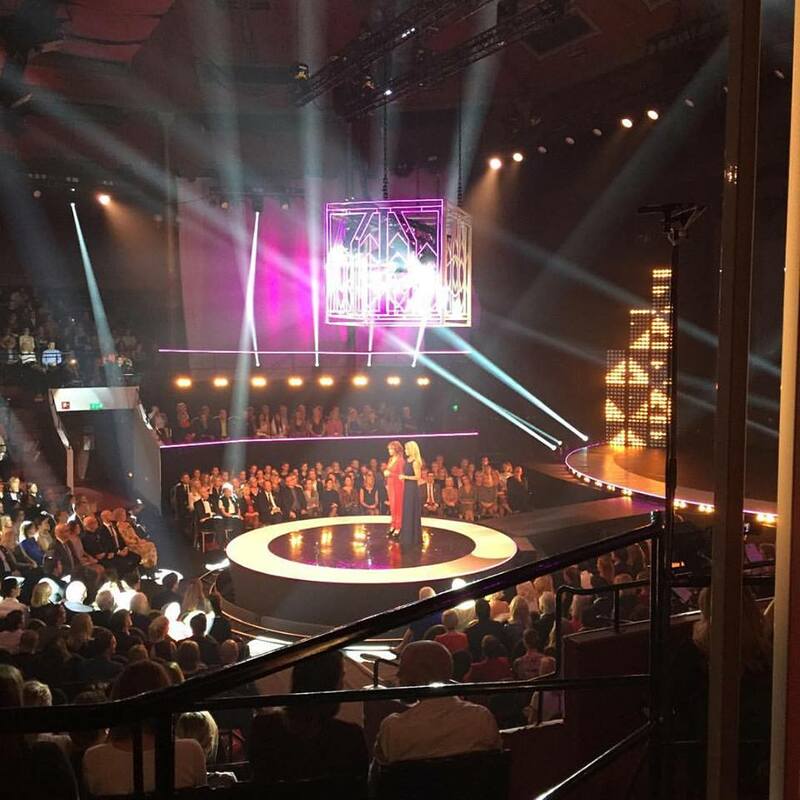 The show is emotional and involves many confessional segments with different interviews both in tape and live at the venue. All in all a good event that we enjoyed and if we get invited back next year I think we will go again. Here is my first attempt att recordinga podcast. I used the Spreaker plattform but uploaded it here as well. As part of signing up for a subscription for the Swedish version Runners World they sent me a complementary Vivofit from Garmin. I had been thinking about getting a activity tracker for a while but had not pulled the trigger so the offer seemed ok. I have now worn this for a couple of weeks and collected data. The most obvious usage is to track your steps during the day. It comes with a standard setting for a goal of number of steps for the day. If you reached your goal it will increase the goal for the next day. Steps is the main data that is collected, other data is calories burned and distance covered. Both these are estimated by the unit. In Garmin Connect you can update your weight and set your own goals. You can also activate the heartrate monitoring. After that you can connect the unit to a heartrate strap. For me the most useful function is the sleep tracker. 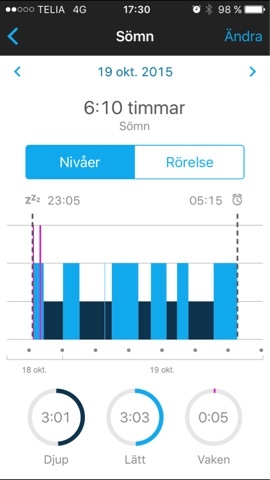 When you go to bed you set it to sleep mode and it will track your movements during your sleep and estimate how much time you spend in light or deep sleep. My second favourite function is the synching via bluetooth with the Garmin Connect app. Just set it to sync mode and a few seconds later the data is available in Garmin Connect. That said I'm not sure how long I will keep using it. I don't think the benefits are big enough to wear it in addition to to my watches (normal or GPS). But I think I will have a activity tracker and the bluetooth synching in my next GPS watch. Yes, date night with Indian cuisine and a move, good times. 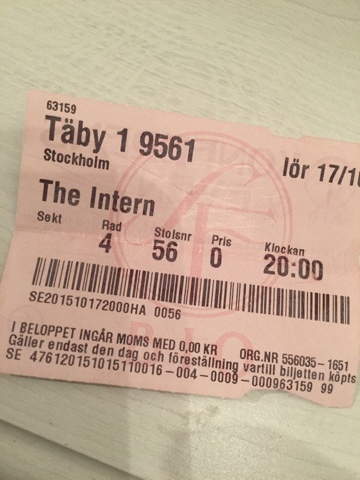 The movie that was picked was The Intern. This is a feel good movie with Robert De Niro Anne Hathaway in the lead roles. De Niro plays a retired man who finds his life boring and under-stimulating since his wife of 30 years (?) has passed away.In an atempt to break out of this situation he applies for a Senior Internship at a internet startup company. This is Senior as in Senior citizen. To no surprise he gets the position, otherwise I'd been home a lot sooner. After this the movie fails to take off, in my opinion.De Niros character solves big and small problems for fellow interns and the CEO. To me it fails to get interesting since he is the perfect peson for the position and always says and does the right things. The wife liked it than me and that is as you know always important.